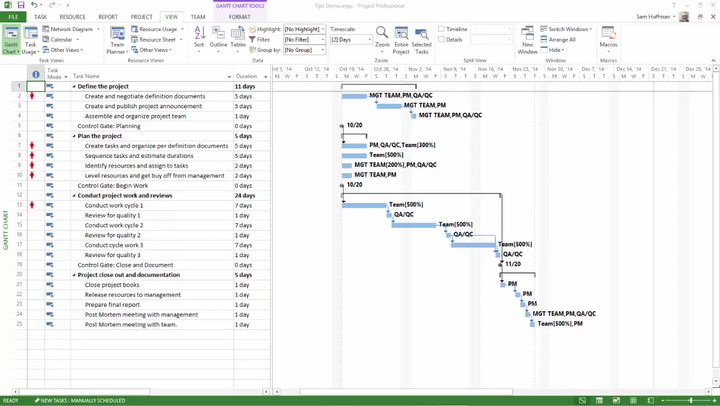 Ever since the 2010 version, Microsoft Project has “the ribbon” – a new kind of menu that is contextual and can be changed to meet users’ needs. This article describes how you can create a ribbon that exactly suits you. As an extra bonus, I’ll also describe how you can share your new Ribbon with your co-workers. Let’s start with some of the basic things everyone should know about the Ribbon. First of all, it consists of Tabs. These Tabs each contain a toolbar with groups, buttons, and other controls (such as the font type entry box). The Ribbon toolbars resize based on the user’s current screen size and resolution. This means that there is always a clear and understandable menu structure. 2 Smaller sized Ribbon including Insert drop down menu. Generating a great new “Project Overview” report (accessed through the Reports Tab > View Reports Group). All in all, I’ve listed a typical day’s worth of project management actions wouldn’t you say? And, if we perform these sets of actions regularly, wouldn’t it be great if the applicable buttons were all on one single Tab instead of being dispersed across different ones? Luckily, Microsoft has got you covered with the option to Customize the Ribbon. Just Right click anywhere on the Ribbon to get to this menu option. Or navigate to File à Options à Customize Ribbon. From the Customize menu, you can create or change the Ribbon mostly to your liking. There are some restrictions. For instance, you can’t remove the default Tabs, but you can rename them or hide them by changing the checkbox value in front of the name of the Tab. In the creation phase, you would want to have every button related to the basics of creating a new schedule. Creating a new task or milestone, linking them together, building the team, and setting a baseline would be great additions to this Group. For execution, you would want to have actions related to the general execution of a schedule. Navigation to the Tracking Gantt view, Mark on Track, and Resource leveling actions would be useful in this case. And finally for reporting, you’d want to create a short little group that contains Timeline, Reporting, and Printing options. You might also want to add miscellaneous actions here if there are additional things needed. Actions need to be linked to group actions, or commands as they are also called, and can be found on the left side of the menu. There is a drop down menu on top that is set to “Popular Commands,” but since you don’t know if “Set Baseline…” or “Build Team From Enterprise” are Popular commands, I would suggest you choose “All Commands” and sift through the mediate of commands MS Project has available. After adding your interesting items to the appropriate groups, your Ribbon could look similar to the example below. The steps are basically the same as with the Ribbon customization, but instead of selecting the Ribbon you select the QAT. The best part is that all these actions will be available to you no matter in which Ribbon Tab you are on. I mostly add the Publish action and the Project Information button on the QAT because I use them so often and it doesn’t make sense to keep changing Tabs all the time. By the way, the Publish button isn’t even on a Tab (it’s behind the File menu/back stage), so it’s a good idea to customize the QAT to include it. So, you’ve created the best Ribbon Tab for your organization with all the default and custom actions you know people would love to have in one Tab. Wouldn’t it be great if you could share that content? Now you can! From the Customize the Ribbon menu there’s a button called Import/Export. This button provides you with the option to create file with a *.exportedUI file extension. Once you created the file, you can distribute this to people who want to adopt your settings to their own Microsoft Project client. I’ve done exactly that with my Ribbon Tab. You can get it through the TPC OneDrive folder for free 😊. Happy Customizing! As always, your comments are welcome below.